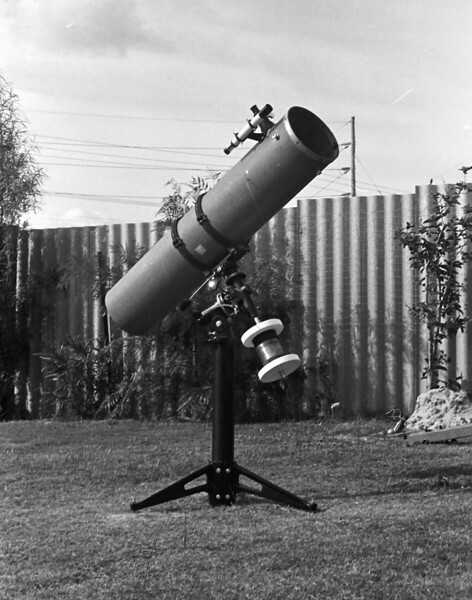 In 1978, I sold my first astronomical telescope, a cheap ~$400 4.5" f/10 Newtonian Reflector that I'd acquired a year or more earlier (and seem to have no photos of), and purchased parts to make an 8" f/6 Newtonian Reflector on a German equatorial mount (no motor drives) for ~$800 from Astro Optical Supplies. I recall intending to do prime focus photography with the SLR and I had a slightly oversized diagonal mirror to ensure good 35mm film field coverage. Film ASA-125 Ilford HP-4 . Scanned using Canon MP980 MFP 6/10/2011. Yes, a descent size for amateur visual observation, but on the upper border of portability and problematic for photography a it turns out. Subject to wind vibration and the mount with enough slack in the gears and lack of motor drive to be difficult to track manually. Now THIS is a beast!